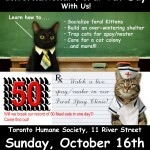 Interested in learning more about feral cats? Come to International feral cat day and learn how to build winter shelters, socialize feral kittens, care for a colony and much more. There will also be the opportunity to watch a spay/neuter operation.